When you see a bird, do you admire the fluffy feathers, think of glistening roasted meat or envision a valuable stuffed showpiece? Does it depend on what you have just done or heard? The truth may just be one duck. I happened to meet David Chan’s students, who are working professionals who have been learning painting from him. From photographs of their paintings, I could not tell that they never had art lessons before David taught them. One of them hinted that David typically signed his art works by cleverly hiding his initials in his art. As we hunted for it in each painting, it was as if we were tricked into examining the texture, the depth and the neatness of his painting skills. That was the real reason some gallery guests that day were peering at the behind of a bird. You must go to the gallery and look through the eyes of these faces and ponder. Are they looking at you or are you looking through them? Who’s the monkey? Are you seeing red? The fleece is made of gold. I am not kidding. 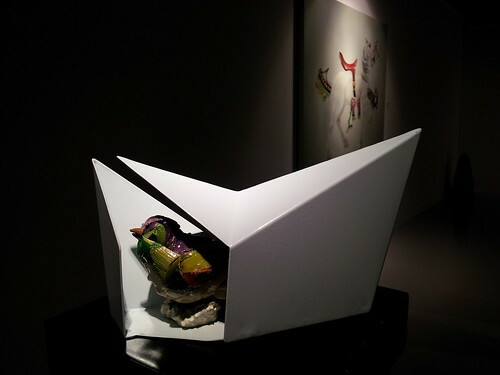 This petite bird peeks from an origami-like structure. Wait, look closely at what the bird is made up of. Gulp. It was a rare treat to get contemporary visual appeal, wit, satire, irony and philosophy with old school painting discipline. Discovering David’s own literature about this series was a delight too — intellectual and unassuming. 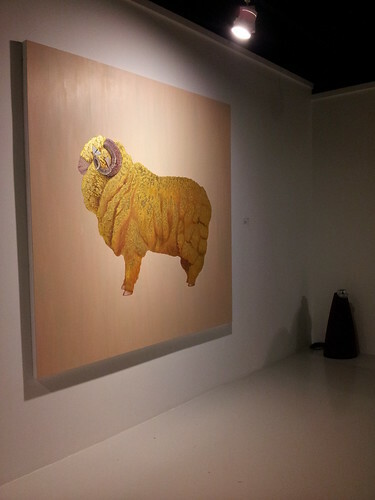 As always, Art Seasons Gallery has a comprehensive catalogue of David Chan’s art works. Its spaciousness is a welcome retreat in the city, especially with its flattering lighting and discreet sound system. 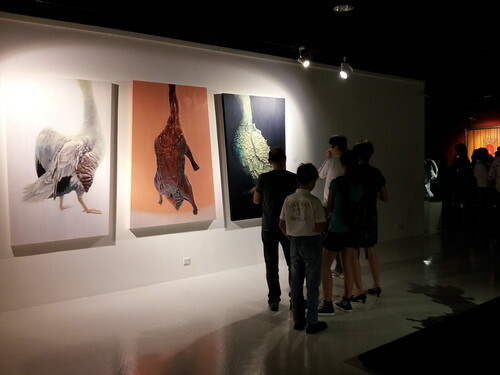 True to theme, roasted duck was served at the opening of this exhibition. View our “Every Trick Only Needs One Truth by David Chan” photo album. View the exhibition before it ends in a few days. 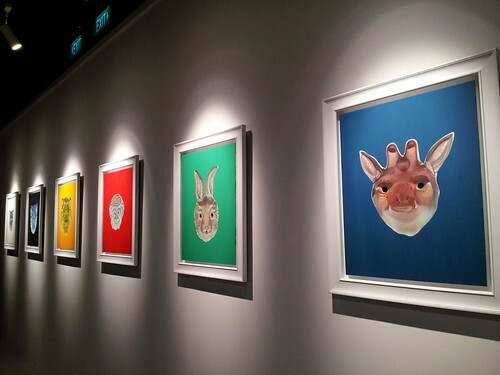 Imelda has more than 35 years’ experience as a Singapore arts consumer who started as an almost reluctant kid. Her arts interest grew, but alas, faster than her wallet.